Fibromyalgia sufferers are universally found to be malnourished, have lowered immune function, have one or more viral, fungal, bacterial infections (again almost always not detectable by orthodox means), and cannot detoxify their heavy metals such as mercury, cadmium, aluminum etc. Therefore, Far-Infrared Radiant Therapy provides a safe, natural form of detoxification which is so very crucial for fibromyalgia patients. Due to impaired metabolism, the person with CFS/FMS typically has a lower than normal core body temperature. This lower body temperature inhibits the body being able to sweat. If the body is unable to sweat, there is a greater load placed on the liver and kidneys to eliminate metabolic waste and toxins. 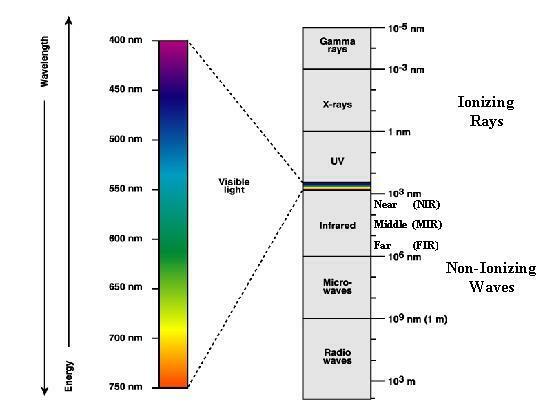 The above graph shows the range of infrared energy output by ceramic FIR heater elements. It is the minerals in the ceramic material that, when heated, emit FIR energy. 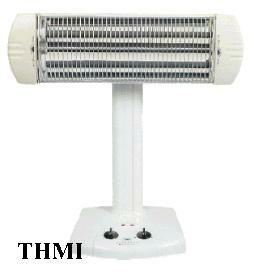 The ceramic heaters radiate FIR energy in the spectrum considered by chinese researchers to be the most therapeutic. 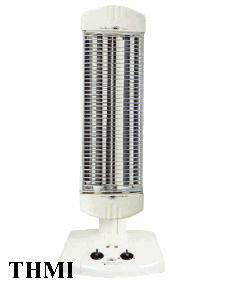 Heat lamps and Quartz Heaters, as indicated above, do not generate energy in the FIR range. There are some articles that suggest that a sauna using infrared heat lamps provides the same benefit as a FIR sauna. There is likely good benefits from using a sauna with heat lamps. However, if the information above which suggests that a FIR sauna is of greater benefit than a conventional sauna is correct, then it is reasonable that a FIR sauna is a better choice. A heat lamp does not generate FIR energy. Information from the manufacturer of infrared heat lamps validates the data shown in the graph. From the manufacturer's website is found, "This lamp [250 Watt heat lamp] is designed for use in applications specifically requiring a short-wave infrared radiation source. Infrared radiation from this lamp causes surfaces to be heated." At this time the most economical means of obtaining the benefits of a FIR sauna is to use two stand-alone ceramic FIR heaters (from THMI) in a small room, such as a bathroom, to create a sauna environment. An added benefit of using stand-alone FIR heaters is that it can be used to provide comfortable FIR heat to any room in the house during the cold winter months. Industrial Applications of Electric Infrared Heating: Look at the graph in Fig. 2-4, Infrared Absorption vs. Wavelength for Water, on pg.7. The graph indicates that FIR wavelength energy has a greater absorption by water. The body is approximately 70 percent water. The effects of repeated thermal therapy for two patients with chronic fatigue syndrome. This pubmed article is the first published in a recognized journal that shows the benefits of regular FIR sauna for people with CFS. The researchers conclusion: "These results suggest that repeated thermal therapy might be a promising method for the treatment of CFS." There were only 2 people in the study, it's a start. Hopefully these successes will increase interest in this modality by other researchers. 8. "Energy Returns with Cellular Purification"